In 2018, we are celebrating the 155th anniversary of the Gettysburg Address. On Nov. 19, 1863, Abraham Lincoln delivered 272 words that not only helped dedicate Gettysburg’s Soldiers’ National Cemetery, his words gave a sense of hope and reunification to a town, and nation, that had been raged by war. His words, 155 years later, still resonate. On November 19, 1863, President Abraham Lincoln delivered a 272-word speech to dedicate a new National Cemetery in Gettysburg, Pennsylvania, the site of the three day Battle of Gettysburg. Although both his time in Gettysburg and the speech that he made were brief, his words have echoed throughout history and his Gettysburg Address has become one of the most recognized and well-known speeches in American history. Today, you can not only witness Lincoln’s impact throughout the town of Gettysburg, you can actually walk in his footsteps. Check out these five locations to walk in Abraham Lincoln’s Gettysburg footsteps! With it’s remarkable history, gorgeous countryside views and spunky personality, the town of Gettysburg, Pennsylvania is full of photo opportunities to remember your travels and make your friends jealous of the adventures you took! Take a look at our list of these perfect “Instagrammable” spots in Gettysburg. For most travelers, Gettysburg is a place that takes at least a few days to experience. Even then, it sometimes takes a trip back to fit in the rest. The historic town, the hallowed battlegrounds and scenic countryside all give visitors a unique look into this small Pennsylvania community. But, sometimes, visitors can be short on time, and want to make the best of just a day in Gettysburg. It’s tough to determine what, however, to include in a day-trip. 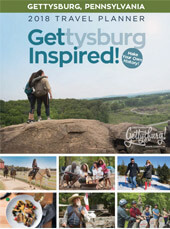 Check out the ideas below for how to spend one day in Gettysburg! By Stacey Fox – As I get older, I start to find great joy in searching out unique items from the past. I want to know what it was used for. I want to know where it was made. I am fascinated by the longevity of pieces from the past versus so much of what is made today and thrown away tomorrow. Hand-crafted wooden pieces of furniture are making their way back into our daily lives with a fresh coat of paint and a new room. By Jess Clevenger – As a foodie, my favorite way to welcome a new season is, of course, through food and what better way to welcome spring than through making homemade peanut butter eggs! Irish pride is everywhere in Gettysburg, including the hallowed grounds of the Civil War battlefield where the famous Irish Brigade heroically charged across the Wheatfield and secured the Union line on July 2, 1863. Tucked into the woods along Gettysburg National Military Park’s Sickle’s Avenue stands tall a Celtic cross, shadowing the Irish Wolfhound. The monument represents the valor of five regiments who, battered and beaten from engagements months prior in Antietam and Fredericksburg, triumphantly secured the Union line as part of Sickle’s army who just hours earlier pushed west toward Emmitsburg Road. How well do you know Gettysburg’s women’s history? By Jess Clevenger – There are many traditions that I’ve been introduced to since moving to Adams County three years ago, and one that I can most definitely get behind is Fastnacht Day. Fastnacht Day, which translates to ‘fast night’ or ‘night before the fast,’ is celebrated the day before Ash Wednesday, and is big in Adams County because of the heavy Pennsylvania Dutch influence of the area. Kids get treated to fastnachts in area schools, you can find fastnachts in grocery stores and many churches make large batches of fastnachts to celebrate. Check out our Visitor Guide online or have us send you one. Have an immediate question? Call us at 1.800.337.5015.